It's one thing to know what notes to play. It's another to know how to think. So far we've talking about "Finding Your Frequency" and "Dialing Your Tone". In this chapter we're talking sparkle. 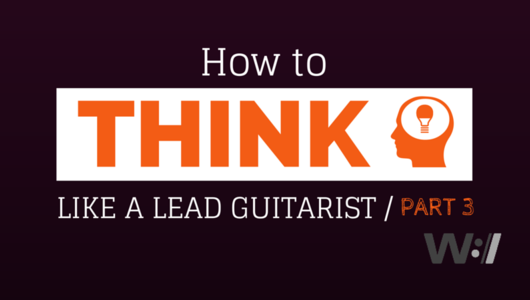 Lead guitar is kind of a misnomer because we're not really leading. We're sparkling. The song is the beautiful dress and we are the diamond necklace that really makes the outfit pop. Too feminine? How about the song is that amazing steak and we are that little pat of garlic butter sitting on top that takes it to another level? Yeah, that sounds better. So how do you sparkle? You look for those parts of the song that need a lift. Sometimes it's some single strummed chords over the chorus. If someone else is already filling that role, try playing some triads up the neck to thicken the tone or some octaves to emphasize a specific voicing. One of my favorite things to do is come up with some kind of counter melody over a section to give it texture. If the chords change a lot, I'll use a simple 3 or 4 note riff but if the chords only change once or twice, I like to play something that really moves. Phil Wickham nails the second verse on "This Is Amazing Grace" and All Sons and Daughters do the same on the chorus of "Hear The Sound". Another one of my go-to's is to follow a melody or lyric I really want to emphasize like Stu G does in the prechorus of "Majesty" by Delerious. The possiblilities are endless. The thing to remember is too much jewelry is gaudy, too much butter makes you sick and too much sparkle guitar is distracting. Pick your spots and don't try to do too much and you'll make that song shine like it was meant to. I've linked a few songs that I think sparkle exceptionally well. The counter-melody on the verse of "In Tenderness" is killer. Have at them. Great lead riff in this one. Your parents have probably not heard this version of the old hymn. Beautiful picking tune. A TON of bonus content. One of our favorite lessons. We play a really supportive role and let the lyrics be the focal point. Bass riff is a major part of the song. Really great, creative piece. That string part is killer. Your communications skills and ability to articulate technique is without parallel. I have utilized your YouTube clips for years and have finally joined your website as a member. With ease, I have increased my ability to quickly learn many new praise songs. As a profession IT consultant, time is of essence and you have helped meet the requirements of satisfying my responsibilities in the music ministry that I serve. Thank you for your dedication to excellence and helping many guitarists, help others sing praise. And when we sing, we pray TWICE! That's awesome to hear and really means a lot. While I love teaching and leading worship, few things are more exciting and satisfying than to hear we're serving the ones who serve. Thanks so much for the comment and don't be a stranger. I'm here all the time. I am breaking into playing lead worship guitar, since there are lots of rhythm around, but few lead. 1) If I become a paying member, do you have a song list of what lessons are currently available? 2) Often I have less than a week to prepare after getting song sheets. Is there any method to email you and get a "quick lesson"? 3) Do you ever cover the effects pedals that were used on the original recordings? 4) A Telecaster is often used in praise music. Do you cover guitar tech, and guitar models?